Elizabeth Strasser and her team have done it again! 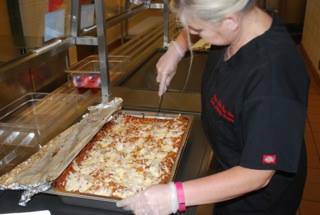 At Trailside Elementary, yesterday’s lunchtime entrée of Lasagna was made from scratch with Summit County grass-fed beef – paving the way for homemade meals with quality ingredients into our schools. The Pilot Project at Trailside will help the District learn what is required in labor, equipment and other resources to move our school food programs to its goal of cooking and serving only non-processed foods from scratch that are delicious and nutritious. 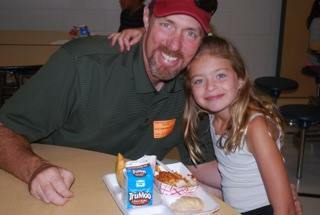 Parents and students enjoyed the lasagna as well as the students! In her few months as Child Nutrition Services Director, Elizabeth has brought back the Fruit & Veggie bars stocked with local produce whenever possible, implemented a Meatless Monday entrée for our vegetarian students, and broadened the daily entrée offerings to three choices daily. She’s one busy lady, committed to improving school food and feeding our kids healthy meals!